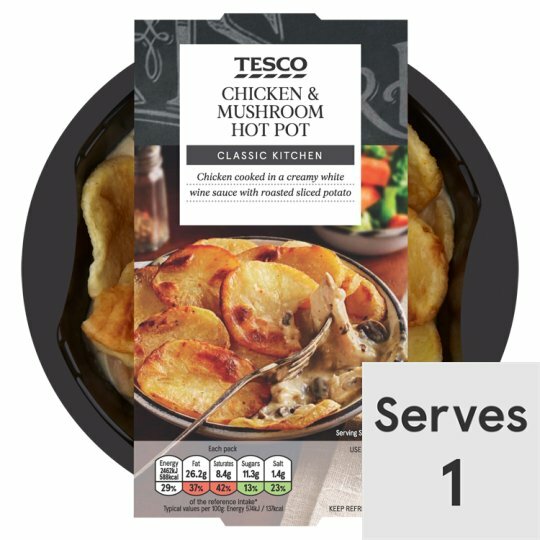 Chicken strips in a cream and white wine sauce with button mushrooms, topped with sliced potatoes. Instructions: From chilled: 190°C / Fan 170°C / Gas 5 25-30 mins For best results oven heat. Place on a baking tray in the centre of a pre-heated oven for 25-30 minutes. Leave to stand for 1 minute after heating. Instructions: From frozen: 190°C / Fan 170°C / Gas 5 40-45 mins Place on a baking tray in the centre of a pre-heated oven for 40-45 minutes. Leave to stand for 1 minute after heating. Heat on full power for 4 minutes 30 seconds (800W)/(900W). Heat for a further 2 minutes (800W) / 1 minute (900W). Heat on full power for 7 minutes (800W)/(900W). Remove outer sleeve and pierce film lid several times. This container my soften but will regain strength on standing.